So unique Isabelle actually came as a shock to me, I predicted she was in the game but I thought she would be an echo fighter. Interestingly enough someone on discord did tell me and a lot of other people that Isabelle would be unique about 3 days before it happened, a lot of people don't take him seriously and I actually laughed to myself thinking "Unique Isabelle is going to be the next character? Yeah right." But it looks like I was wrong. He has a source that tells him stuff. His source even told him that Isabelle would be the next reveal before the direct aired. Anyways back to my prediction, unique Isabelle definitely changes things to the point where it would make sense. I had to take a step back and look at the predictions I had and see what the most logical choices were. What really stood out to me is how much sense it makes now, I have a timeline that actually works. Before the direct was announced I didn't think anything would be revealed in the direct until I heard it was about 3ds titles and switch titles not just the online features of the switch. Loz18 was proven a fraud, and Vergeben just got more credible. Okay so this is where I had to make some executive decisions. I believe the next smash direct will be in November, there has never been 2 Nintendo directs that have not been at least 1 month apart. We just had a nintendo direct this September so a October smash direct is out of the question. I do believe that we are running out of time though so I think we will get a surprise newcomer in October just like Lucina / Robin were announced in smash 4. It could even announce the already mentioned November Smash Direct too. Newcomer 1: The gen 7 Pokemon Vergeben is talking about has to be Incineroar. He fits the bill of being a wrestler and I think he would fit in quite well with the rest of the smash bros cast. His name also isn't Lycanroc, Decidueye, or Mimikyu who Vergeben deconfirmed, so that's a plus too. The only other viable contender is Tapu Koko but I think Incineroar fits better in smash bros. Newcomer 2: The new square rep Vergeben is talking about has to be Geno, there is no denying it, Sakurai has wanted him since brawl and got a costume of him in 4. I think Sakurai finally got Geno into smash bros this time. He is also a highly requested fighter and has been for years, I'm sure he did great on the ballot. I think Geno's inclusion just makes sense. Echo 1: Ken is a really obvious echo fighter, he was also leaked by Vergeben and he makes sense. The only time left to reveal him is in a Smash direct along with 1 more echo fighter. So that leaves us with 1 more newcomer and 1 more echo fighter. Incineroar is the surprise character in October. So the November smash direct would start out with Geno then announce Ken. So I had to ask myself who out of Isaac, Bandana Dee, and Banjo would produce more hype than Geno at the end of the smash direct? I think that the answer to that question is Banjo, he would produce massive levels of hype that could easily outshine Geno. So it's a 1 on 1 between those two. Out of the two Shadow would make a better echo fighter than Dixie Kong so I had to go with Shadow on this one. It would do Dixie Kong more justice to be a full on unique newcomer. I also think Shadow is more popular than Dixie Kong outside the smash community especially among the younger age group. Shadow is also heavily speculated in Japan. The absence of his assist trophy is very odd. Shadow is also the 2nd most popular character in the sonic franchise, at one point Shadow was more popular than Sonic himself, so simply replacing him with the less popular Knuckles doesn't make sense at all. So that pretty much explains everything. He got bumped off simply due to roster size, if there were 2 more months before the release of ultimate he would make it into the base roster. At this point he could be in the base roster but only if Banjo or Isaac don't make the cut. If he is not in the base roster he will be one of the first DLC fighters. As mentioned earlier the last character needs to overshadow the level of hype made by Geno and out of the 3 Banjo could overshadow Geno's hype. He got bumped off simply due to roster size, if there were 2 more months before the release of ultimate he would make it into the base roster. At this point he could be in the base roster but only if Banjo or Bandana Dee don't make the cut. If he is not in the base roster he will be one of the first DLC fighters. As mentioned earlier the last character needs to overshadow the level of hype made by Geno and out of the 3 Banjo could overshadow Geno's hype. Let's face it, I only put him on the list because I wanted him to be in the game. 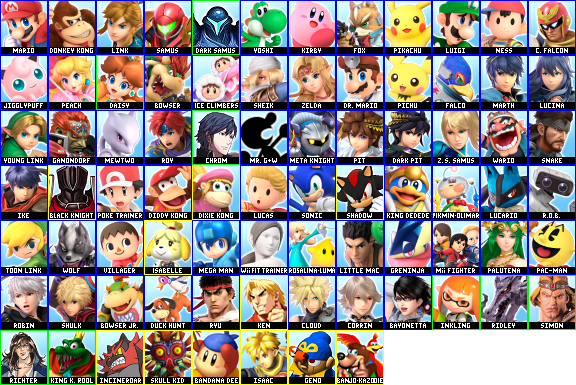 Before Isabelle the unique fighter count was pushing it but now, there's no way he'll be in the base roster if Isaac and Bandana Dee aren't. I still think Paper Mario would make a great fighter and I hope to see him as DLC. Loz18 was a fraud. He started out with info about E3 and no longer had a source afterwards. He used the credibility he gained from the leaks he got correct to drum up support for Skull Kid, who is now a very popular character possibility. Now I think Loz18's goal was to drum up support for skull kid so that he would gain enough popularity to become a DLC fighter. That's a pretty smart plan if you ask me. But only if skull kid isn't a boss character. As mentioned earlier she would have to fight Shadow for a slot as an echo fighter. I don't think she will because Shadow is just too popular 1 on 1, and she would make a better unique fighter. Dixie Kong fans, do not worry, she will probably be a DLC fighter, and if you are lucky she'll even be a unique fighter! It could even be announced alongside a new Donkey Kong game. As mentioned before Geno is somewhat on the leak radar, however the last remaining newcomer is not described at all by any leak it just simply exists. This leads me to believe Geno will be revealed at the beginning of the November Smash Direct and the character occupying the last newcomer slot will be revealed at the end of the direct. This obviously put things into perspective. It proved Loz18 was a fraud, took out skull kid. All in all this change put my roster prediction into perspective. It brought my prediction to a point where it could actually happen. The only bad thing for me is it made my original prediction somewhat wrong. I predicted she would be an echo, but instead she was unique but it's a small price to pay for having an accurate prediction. I really can't ignore the fact that bandana dee isn't present in dedede's final smash. And considering this is a character who frequently polls very high I had to put him back in. It was brought to my attention that the tweet I referred to was very different from the situation with Kojima's tweet. Phil saying "Yep" doesn't say whether or not Banjo is in the game, it simply reiterates Phil's previous stance. I stand by my earlier statement that Banjo is the most likely new (as in not from a 3rd party already in the game like sega. namco, capcom, square enix, konami, etc ) 3rd party character to be added to the game. I am sure Banjo will be revealed last if he makes it on the roster. I think Paper Mario is a good contender for super smash bros, I would not be surprised if he was added, but I also wouldn't be surprised if he didn't. He polled pretty high and he is an easily recognizable fighter. The only thing that makes me think he is unlikely is the abundance of Mario characters already in the game. I feel pretty good about my roster, and I know I'll get a lot wrong. At the end of the day this is a roster I would be happy with and I think it is totally within reach. Something I also noticed is how weird the prediction looks if you look at the estimated releases. 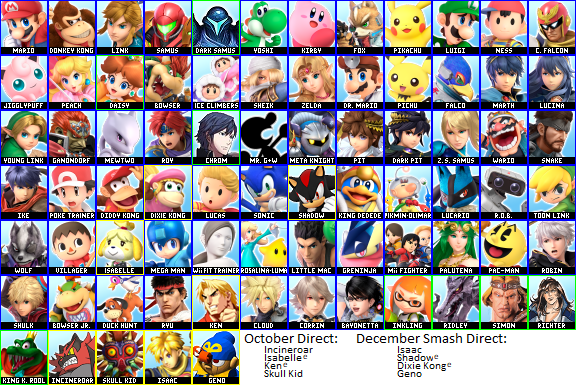 I think getting 3 newcomers and 2 echo fighters in a regular direct in October would be insane, I also think that getting 4 unique fighters and 2 echos in December would be crazy as well. That is what motivated me to make the cuts I did last time. But at this point I am just following my instincts and looking forward to seeing how close I am when the game launches! 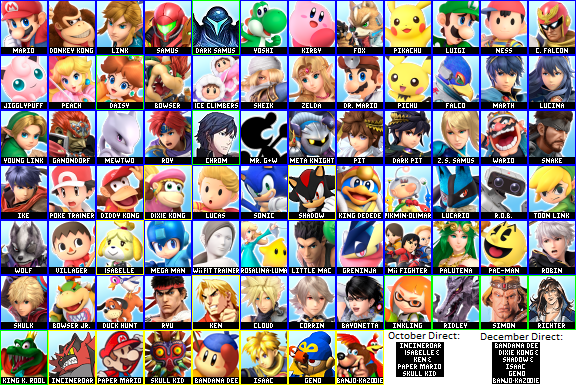 This is pretty much my final roster prediction, I will update it when new characters are confirmed and I'll put de-confirmed characters in red on the side of the roster. The Black Knight didn't seem like something that would be a fighter. I think his absence in castle siege means he is going to be an assist trophy. It reminds me of when Kojima said he wanted snake to appear in SSB4. If Banjo was in the game Phil Spencer would most likely ignore the tweet instead of responding with "yep" If Banjo gets in the game he would be revealed last. This decision was also influenced by the issue of having too many fighters in one direct, If a 3rd party rep from a new company were to get in the game this would be the one due to his extreme popularity on the ballot. I'll consider adding him in my prediction again but at this point it's difficult to tell. I think Smash Bros will not get a reveal in the online services direct due to how close it is to the August Smash Direct. I think they will mainly focus on the online services and nothing else. I do however think we will get a regular Nintendo direct in October which puts a buffer month between December where there will be a smash direct before release. 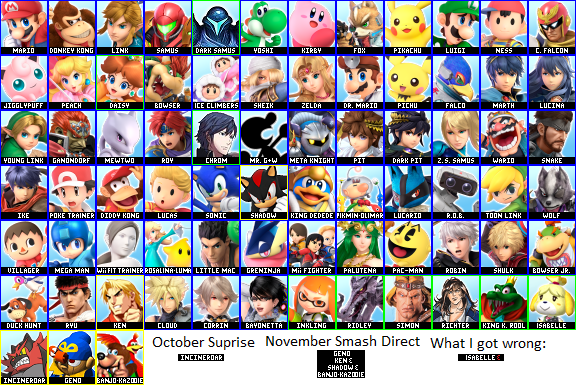 They could definitely surprise me and reveal something during the online service direct and then the final smash direct would be in November. I mean, all Phil said was "Yep", which is a far cry from the Kojima tweet. It doesn't mean much one way or another, and definitely doesn't break NDAs or raise eyebrows. Kojima's tweet on the other hand was him literally saying "I don't think Snake is coming back to Smash Bros. but tell Sakurai we want him!" It's almost like saying "No comment". He's just repeating his position which he had stated previously years ago.